It’s a rare blank day at the World Cup and so its time to catch our breath after the all the excellent betting opportunities lately, not just in Brazil but also at Royal Ascot & Wimbledon (and that’s without mentioning the Cricket, Rugby & F1 too!). So with such a hectic schedule and so many sports to bet on, is it any wonder that so many people are turning to tipsters to help them make money betting? And if you are looking for help to find the best tipsters…well this is where we come in as our unique Tipster Profit Reports contain the latest results and rankings on over 50 of the best tipsters in existence. Last night might have all but signaled the end of England’s World Cup dreams for another 4 years, yet for those of you who followed our Free World Cup Football System and backed Uruguay at odds of 3.80, there was something to be cheered with last night’s result. 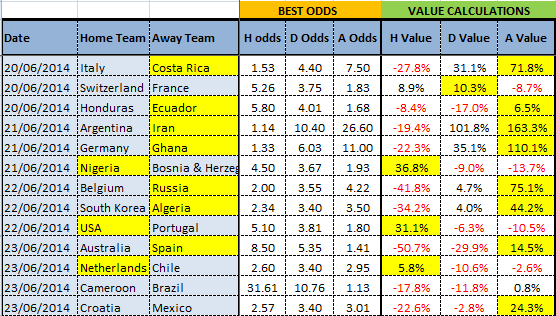 As the table below shows (which is based on our system), there was 31.5% value in backing Suarez and co at such a big price, along with further bets on both Colombia and Greece to ensure another profitable day. 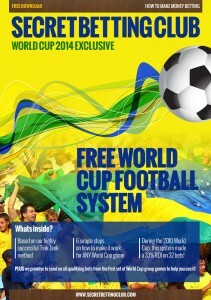 Click Here To Grab Your Free World Cup System! This continues what has been a very strong start to the World Cup for our free system with other winners including Mexico at 2.37, Costa Rica at 9.00, Holland at 5.22, USA at 3.02 and Chile at 6.50 to name just 5 successful bets. If backing all ‘value’ bets from the system, you would now be sitting on a 14.58 pt profit from just 23 pts staked (63.39% ROI). Alternatively if backing all bets with a value rating of 10% and over, this would be even higher at 15.25 pts profit (66.30% ROI). It is unlikely this very high ROI figure will continue throughout the World Cup but at the half-way point for the Group Stages, we are sitting very pretty. For those of you keen to follow the system yourself, below you can find the qualifying bets for the next few days, where there are 13 value bets from the 14 games due to be played. The only game with no effective value is Cameroon vs Brazil, where the hosts offer just an 0.8% edge at the very short odds of 1.13. Thus I wouldn’t recommend this as a bet. What should I do when there is value in both a team to win and the draw? Should I factor in any ‘home-team’ bias for South American sides? This is a very good question as the system does allow to either select ‘neutral’ fixtures, which we have applied to all games except Brazil. Having watched the tournament, many other South American sides such as Argentina, Chile or Uruguay also have played in front of plenty of their own fans, creating a near enough ‘home’ atmosphere in their fixtures. With this in mind, there is certainly something to be said for factoring in home bias on South American sides other than Brazil. For example, Iran would only have a 9.9% chance of beating Argentina if playing on neutral territory, yet if played on Argentinian soil this drops to 6.4%. The knock-on effect in terms of their betting value would drop from 163% to 70.2% – more than halving the recommendation. My suggestion would be to apply some weighting to this home factor for all South American teams, especially where the value is borderline. Does this system just pick outsiders? No, that is a common misconception as whilst the highest proportion of bets is on the larger priced teams, there have still been plenty of value calls for the favourites. For example we have had Brazil to beat Croatia, Chile to beat Australia, Russia to beat South Korea and Spain to beat Australia put forward so far. This system will often surprise with its value suggestion – its not always the outsider! Is it worth using the Asian Handicap market when backing a big-priced outsider? Yes, I certainly feel that is the best approach in certain games such as Iran vs Argentina, where they are ‘officially’ offering over 100% value at the odds of 26.60, but realistically we all know its unlikely to come off. Even our system rates them as having just a 9.9% chance so still expects them to only win 1 out of 10 times (possibly less if factoring in some home bias for Argentina). In this instance it is often better to back the likes of Iran and others in the Asian Handicap market. You can choose one of two options – take either the Double Chance market on Iran (you win as long as Iran dont lose) where they are as big as 6.50 or alternatively play the +2.25 Asian Handicap market at odds of 1.96. Similarly, if backing a short-priced favourite (Spain to beat Australia) you might also like to back them to overcome a handicap to improve the odds you take. The very latest Smart Betting Club Tipster Profit Report is out now and features the latest results for 52 of the very best betting tipsters we have uncovered in over 8 years of independent reporting. In this report you can find tipster league tables, ratings and our sought-after ‘Hall of Fame’ listings, all aimed at helping YOU identify which often little-known tipsters are genuinely profitable. The 22 tipsters listed within our Hall of Fame – those we recommend as the very best to follow. The 4 free to follow racing tipsters picking out consistent winners. The in-form football tipster with a £3,818 average yearly profit. The flat racing expert with a 33% ROI from their 650 bets on turf – ideal for following this coming season. Plus as ever, the latest Report also contains our Independent SBC ratings and rankings for each tipster on everything from profitability to odds availability and professional betting bank advice. Helping you to find not just the most profitable but also most practical to follow – that can make a real impact on your betting. 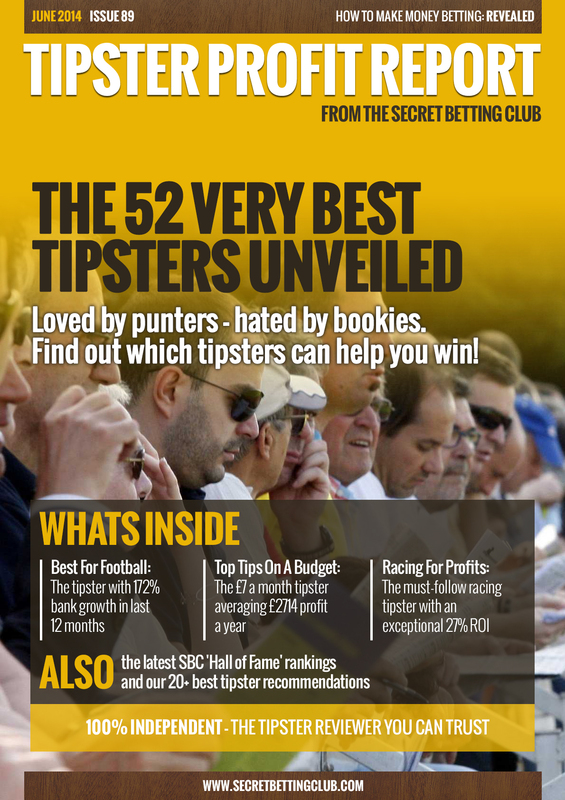 You can pick up your copy of this latest magazine, the instant you join our service at the Smart Betting Club. That’s not all though because as an SBC member you will also gain access to our huge 8-year year back catalogue full of tipster reviews, expert interviews and guides, betting systems and profitable betting advice. All of this is supplied complimentary to every new member. World Cup Fever has well and truly taken over at SBC Towers with the release of a very special World Cup Football Betting System that you can download totally for FREE! This system is based on our successful ‘Fink Tank’ method, which during the 2010 World Cup, made a 33% Return on Investment from 32 bets. In this free guide you can learn how to run the system in 6 easy steps and how to pick out the best value bets for every single fixture at Brazil 2014! As a further bonus – all who download our World Cup System will also receive details of a 10% discount code to save you money if joining the Smart Betting Club. This free World Cup System is not all we are giving away as before the tournament starts itself, we will also send on the ratings and qualifying bets for each of the first set of group fixtures – to help you follow this system that bit easier!